Following negotiations, the British Medical Association (BMA) has now (November 2016) agreed to suspend industrial action relation to the proposed hospital trainee contract, and is seeking to work with the Government to help implement a new contract. The BDA will therefore, no longer be taking action, but we will continue to call for a contract that rewards the skills and efforts of trainee hospital dentists, and one that works for our patients. February 2016 was the first time the BDA had taken industrial action and we thank our members for standing together to fight alongside their medical colleagues. We will keep our members informed of the new contract developments (due to be rolled out in early 2017) and will continue to provide you with advice and support in these turbulent and challenging times. As at April 2018, there are currently proposals by the government for a review of the 2016 hospital trainee contract, but that would require the BMA to formally end its dispute over the contract. We will update members when further information becomes available. 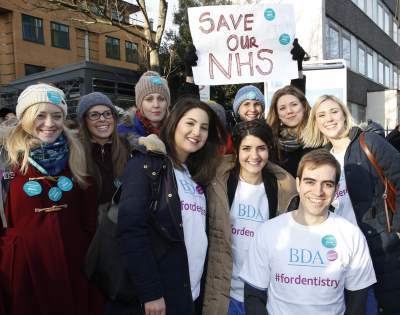 If you are not a BDA member, please consider joining with us, so that we can represent your interests and fight for all dentists working within the NHS.